Take the humidifier apart and find out where the dirt, mold, lime scale, and whatever else is. Clean out the water reservoir or basin. Clean out the water tank. Clean the top of the humidifier. Maintain your humidifier on an annual basis. Regular use of bacteriostatic additive. 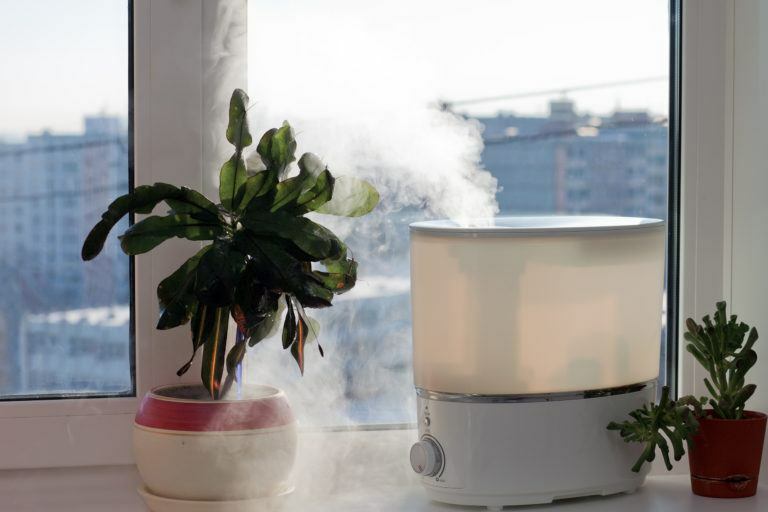 For those of us with some sinus conditions, a humidifier can be a blessing in the winter months when the air is dry. Unfortunately, an unclean humidifier can definitely be a hazard to your health. The moist area of a humidifier is the perfect place to grow bacteria. And water vapor is the perfect carrier of that bacteria. There are four types of humidifiers: ultrasonic, cool mist (impeller), evaporative, and steam vaporizers. Of the four, the safest are evaporative and steam vaporizers because the evaporated water cannot carry bacteria as well as the tiny water droplets the other two create. But they can still harbor microorganisms in the tank. Use of a bacteriostatic additive and regular cleaning can nearly eliminate any risk of infection. The following is the best way I have found to clean a humidifier. 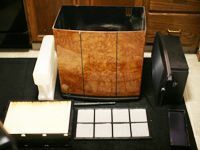 The humidifier in the pictures is an evaporative wicking console humidifier. But you should be able to use the advice here to clean any humidifier to keep your sinuses happy, and the rest of your body healthy. 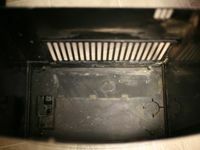 Take the humidifier apart and find out where the dirt, mold, lime scale, and whatever else is. The humidifier will come apart pretty quickly, and the collections of dirt should be relatively easy to spot. Most of the dirt will wash off fairly effortlessly with soap, water, and a sponge. Even most of the lime scale will come off with ease. For the scale that sticks a little more, use vinegar and a green scrubby. If you have mold growing, wear a mask and use hydrogen peroxide to kill the mold and remove it. Clean out the water reservoir or basin. 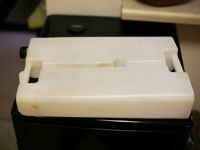 In a wicking humidifier, the water sits at the bottom and is wicked up through paper which has air moving through it. This reservoir is probably going to be the dirtiest part of the humidifier. It will have lots of dust and lime scale to get rid of. Use soap and water to remove the grime and as much of the lime scale as you can. If some lime scale persists, use vinegar and a green scrubby to get rid of it. 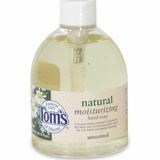 I washed mine out in the tub because it is easier to contain the water, and the shower works really well for rinsing. Clean out the water tank. There is no real easy way to clean the inside of a container with a very small opening. The best thing you can do is put some soapy water in and shake the crap out of it. Then rinse it out several times, shaking it each time. Then sanitize it with hydrogen peroxide. And rinse it out several times again. The outside is the easy part. Just use soap and water and a sponge. Rinse and sanitize if you want. It’s not really necessary, but you might as well. Clean the top of the humidifier. The top of the humidifier likes to collect dirt and other things because stuff falls in there all the time. The unfortunate reality is you will have to disassemble the motor mounting in order to get to the dirt trapped underneath. If you are pretty savvy at disassembly and reassembly, then go for it. If not, use a vacuum cleaner to get what you can. Try not to get the motor wet, though. If there is mold growing in there, which to me seems highly unlikely, you will have to get at it somehow. And use hydrogen peroxide while wearing a mask to get rid of it. Maintain your humidifier on an annual basis. 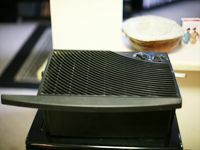 Most humidifiers are inactive for most of the year, so I recommend cleaning it at the end of the year and storing it somewhere it won’t get dirty. That way you don’t have to clean it before you use it again. 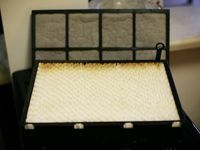 Humidifiers need to have new wicks and filters every year. Make sure you change it each year. There is no point in giving mold and bacteria a head start. Clean your humidifier regularly, and keep it dry when you are not using it. If you leave standing water in a humidifier, you are asking for trouble. Regular use of bacteriostatic additive. For evaporative humidifiers, it is recommended that you add something to keep the bacteria from growing in the water. It is called a bacteriostatic additive, and there is a specific kind for wicking humidifiers as well as for other humidifiers. There is also an additive to help reduce lime scale, but I cannot attest to the effectiveness of that product. The lime scale comes from minerals in the water you are using. One way to reduce lime scale build-up is to use distilled water, which has no mineral content to speak of. Never let the humidity get above 50%. 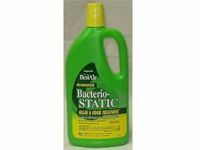 Use a bacteriostatic additive every time you refill the tank. Keep it dry when not in use. Use demineralized or distilled water. Use a hygrometer to monitor indoor humidity levels. Don’t let kids play with steam vaporizers. Don’t use bleach in place of a bacteriostatic additive. Replace filters and wicks on a yearly basis. 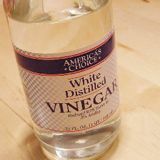 Vinegar is a potent cleaner and stain remover. And, better yet, it is super cheap and you probably have some already. 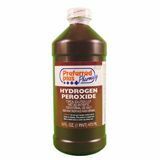 Hydrogen peroxide in a 3% solution is just as effective a sanitizer as bleach. And it is not nearly as harsh for a human to be exposed to. You can get Food Grade 3% hydrogen peroxide from Amazon. Soap works by ganging up on dirt at a microscopic level, surrounding it and making it easy for you to wash it down the drain.